Fjallraven Singi Down Jacket. They say winter is the season to cuddle up indoors with your loved ones, but we say winter is just as good a time as any to get outdoors with them. The Singi Down Jacket W is just the garment to be outside in, with the people you love. 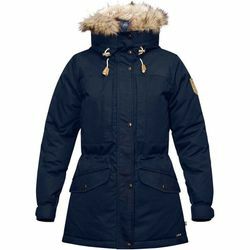 A warm and durable, traceable-down jacket for winter's coldest days, this classic, women's long model has outer fabric in hardwearing G-1000 with extra durable G-1000 HeavyDuty over the shoulders and rear (fabric that can be impregnated with Greenland Wax for that extra protection against wind and rain). With high-quality down padding reinforced with synthetic padding over the shoulders and elbows, the Singi Down Jacket W has a generous, yet feminine fit for insulating layers underneath and has a specious, adjustable hood with detachable, synthetic fur edging for protection from swirling snow. The perfect jacket for low-intensity winter activities in crisp winter weather - so you don't have to be stuck indoors.